Bravo! Encore! You are probably one of the few people in the British isles who still regularly attend classical concerts - more power to you! Odd--never knew Maryland was part of the British Isles. Must have missed the memo back in 1776! Maybe they think the unwashed masses of the New World would have no interest in an arts quiz. You've kept this secret very well -- as you know I've read every post in these threats since #1. That reminds me, I tried and tried with to get into this important piece back in the seventies. No joy. OK people, time for a pop quiz. NO CHEATING. Nine out of ten, but I was guessing several as well . (If you don't know number six, and I didn't, that feels like a pretty open field of options.) I'm certainly not an expert. It was the second question I got wrong ... and I got it wrong with such confidence that I'm rather irritated by that! That reminds me, I tried and tried with to get into this important piece back in the seventies. One of his few accessible works! I tried and tried with Britten myself, with varying rates of success, but if it's any consolation I don't think there's any shame in not liking his music. I am listening to Stravinsky's Ebony Concerto & Symphony in 3 movements now. To be honest it is nothing special sonically but the performances are very good. The Ebony Concerto makes my entire room vibrate when the low notes hit. Nothing I can do to keep it from happening really save for turning the bass all the way down. It is the only piece of classical music--- or any music--- I own that does this. Kind of a bummer because that is an amazing piece of music and the performance is stellar. Symphony in 3 movements sounds a lot better and does not make the entire room rattle. Anyone else have this? I would be interested in someone else's opinion from a different stereo. I have found the Mercury living stereo sound the best off of HDTracks followed by Living Stereo. Sorry it has taken a couple of days to get back, I have just played this piece fairly loud, it is my favorite performance and did not remember any bass problems. The bass is deep but with my pressing on my system it is no way overt, and the recording is good. My pressing is quite late the bright red with blue top, center label, maybe earlier pressings are cut differently. Of course I was also pretty good with Trivial Pursuit back in the day. This is not a music quiz but a trivia quiz NB. NB again British critics are so parochial they think you must be British to get a 10. John S and Robin L like this. BTW. I got nine out of ten on the Guardian quiz, still don't know if it was the Debussy or Britten I failed in. I do not think Britten's War Requiem is the easiest of him to come to terms with. Try the violin concerto, Les Illuminations, the Serenade for tenor, horn and strings, Noye's Fludde and the beautiful String Quartettes,the Spring and Simple Symphonies all in superb Decca/Argo recordings. Not the world's biggest fan of Britten, but found Noye's Fludde very moving and the original LP a remarkable audio production. There's a recording of the Young People's Guide to the Orchestra led by the composer on Decca/London sans narration well worth seeking out both as performance and sound. You an Elliott Carter fan, to me he is the great American composer. I more of a fan of anyone who makes it to 104. As for "Great American Composer" I'm torn between Duke Ellington and Charles Ives but there are times when I seriously wonder what a Randy Newman symphony would sound like. Satie made the joke about La Mer. May Queen was the answer to the Britten question concerning Albert Herring although technically it was as an (effeminate) May King. 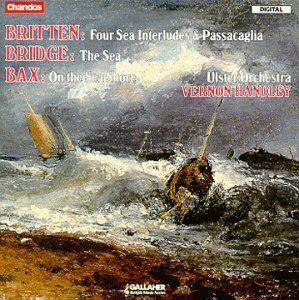 The only Britten piece that I listen to regularly is Prince of the Pagodas although it does have a few longeuers. His operas are more dramatically effective than musically captivating IMO. The other mentions are certainly worth a listen and many will find at least one or two worth having. Playing Beethoven Pathetique, Solomon the world has become still. When Moravec plays it, the world becomes an earthquake. Scott Wheeler and royzak2000 like this. That's why I picked countertenor. But and in any case "La Mer" was guesswork. And me, all though if I had really thought about I would have remembered his his friend Peter sang it. not a piece I play often, like my opera sad. Although there are touching moments. Vivaldi was called the Red Priest. Robin I visited Fresno in 1979 on a Greyhound trip between Arizona and California, don't remember much I'm sorry, a big red brick building on a corner, and finding that I should have taken the coast road. The wine country was good to see, but I know you are going to tell me what I missed over two days in Fresno. I have a recording of Beethoven forth Con by Moravec. on tape, from the radio I don't know the conductor it is my favorite. I got this because I was curious about Bridge and I was interested in the sea theme of this album. I enjoy it, even though a lot of this music sounds like well-conceived movie music to me. But and in any case "La Mer" was guesswork. I figured Stravinsky was the author of that sardonic statement. Thanks for the reply -- sorry I wasn't clear -- they were referring to the HDTracks release when I chimed in. I guess when I quoted it I left that out. -- I would love to have a vinyl pressing like you have. It is a great performance.